We live in a disposable world. As Jamie so eloquently writes in a recent Plated Stories post, we are Boxed people. Pry open cardboard cartons, snick open along the trail of glue or zip open the cardboard zipper, and dispense. We fill ourselves with non-food, and the waste piles up. It didn’t used to be like that, though. Chances are that our grandparents grew up eating real food that they either grew themselves or got locally. Dry goods included staples such as flour, salt and cornmeal, and not macaroni and cheese, Jell-o and rice pilaf. Depression-era cooks were of necessity adept at stretching out more expensive ingredients with inexpensive or foraged ones. Meat was used as a seasoning, if it was used at all, and nothing was wasted. Poor Man’s Meals abounded, assembled from what was cheap and plentiful in whatever region folks lived. Precursors of hamburger helper in the days when people helped themselves; stick-to-your-ribs meals to sustain those with very little and who made do with what they had. One poor man’s meal made famous in the digital age by then-91 year old Clara of Depression Era Cooking on YouTube features potatoes, onions and hotdogs. See? (And yes, Clara is still with us, at the age of 98. I checked). 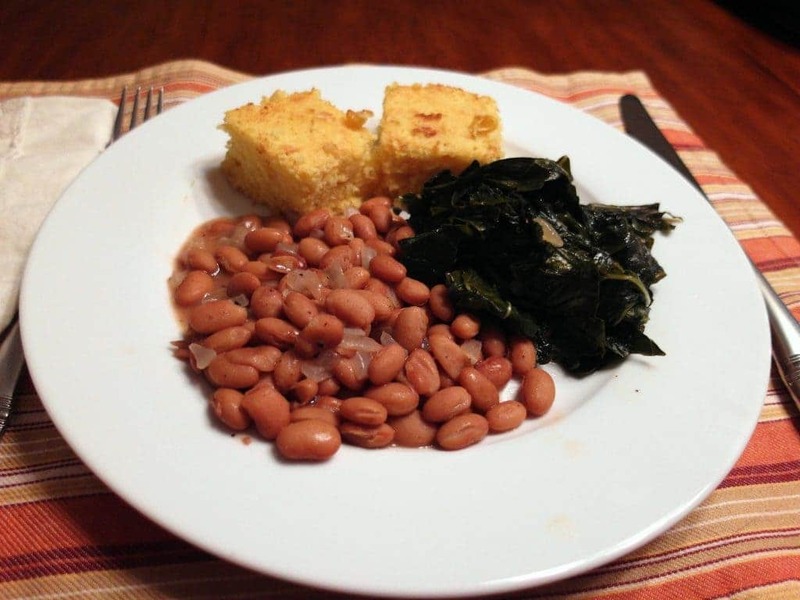 Where I was raised in the South, Poor Man’s Meal meant greens, pinto beans and Southern (not sweet) corn bread. My mom was raised in Queens, so I never had that version at home, but when I worked at what used to be called Thompson Children’s Home back in the late 80’s, Miss Anne, our wonderful Southern cook, made it for lunch once or twice a month. And man was it good! Her cornbread soaked up all the oniony, vinegary juices from the pintos and the greens, and chopped all together, it was a satisfying and filling meal, if not so beautiful to look at. Since we had our Ken’s Korny Corn Maze party last weekend, we had an abundance of cornbread. I had a huge bag of collards in the fridge and some canned pintos. Cooking from dry is usually best, and certainly cheaper, but I had ’em, so I used ’em. Large leaves of collard greens can have stems as thick as your thumb, so you have to cut out them out or dinner will never be ready. Once you thoroughly wash and stem the greens, it all comes together pretty quickly, especially if you’ve made your cornbread ahead (or if someone makes some for you and brings it to your house). Cook your beans (and no, you don’t have to use pintos if you don’t want to) however you like. Beans like pork, so if you have some bacon or fat back, use some of that. I cooked ours very simply with some chopped onion sauteed for a few minutes in a bit of lard, salt and pepper, and a dash of hot sauce. Here’s how I made my collards, and this method can be applied to any sort of green from spinach to kale to beet greens. All you need to do is adjust cooking times depending on how tough or tender the greens are. Use this method to cook almost any sort of greens. Change up the ingredients as you see fit. This is more about technique: saute aromatics, add clean, wet, chopped greens and some flavoring and cook down to desired doneness. While I love this particular combination of flavors, you might not. Feel free to substitute! Fill a clean, deep sink full of cold water. Fold leaves in half along the main rib and then, using a sharp knife, cut the leaves away from the rib. Cut the leaves, cross-wise, into several fat ribbons, and then toss all the ribbons into the water. Swish them around a few times with your hands, allow any sand or dirt to settle to the bottom of the sink, then lift the ribbons out of the water and drain in a colander. You may have to do this step two or three times, depending on how sandy your greens are. Heat a very large, deep saute pan or Dutch oven over medium heat, and then add the fat. Once the fat is hot, toss in the chopped onion and sizzle for three to four minutes, until translucent. Put in all the greens, along with any water clinging to the leaves--they will most likely fill the pot but will cook way down, so worry not. Add a bit of pepper flake, salt and pepper, vinegar and honey, put the lid on the pan and let cook for about five minutes. Lift the lid, give the greens a good stir, and then taste. Adjust the seasonings as necessary, and continue to cook over medium to medium-low heat until the greens are as tender as you like. Serve hot with some of the juices to pour over. To serve this Poor Man’s Meal Feast, you can either put the cornbread in a bowl and then pile on the beans, greens and some of the “pot likker,” or you can serve on a plate. Either way, be sure to cut up the corn bread so you get a bit of everything in each bite. From the time I was a relatively young teenager, I have enjoyed bodice rippers historic romance novels as light reading. The kind where, if you’d open at random to any page, you’d likely stumble upon a love scene. Books in which swords and sheaths meant something very different from weaponry. As titillating as those passages were for my teenaged heart, my favorite parts were the three- and four-page descriptions of feasts. Feasts in palaces, feasts at inns, feasts in chateaus. Never were our star-crossed lovers anything but upper class. They all rode ponies and smelled of heather and lived in castles and had maid- and man-servants. They all had even, white teeth and dowries and ships and land. And feasts. The description of feasts and the dishes served were every bit as voluptuous as Our Heroine’s pale, creamy, heaving bosom. Saddle of venison with chestnuts and wild berries, whole suckling pig with prunes and apples, pheasant pie swimming in brandied cream sauce. Bodice rippers: the original Babette’s Feast. As much as a sweet pie is a lovely ending to a meal, savory pie has been around much longer and has been part of a meal rather than an end to one for hundreds and hundreds of years. Originally, the dough that encased a savory pie was all but inedible and was a serving vessel and preservative rather than a part of the dish. The servants may have been given the leftover hard crust to gnaw upon or to dissolve into their soups or stews as a thickener, but the Upper Crust only ate the filling. Thank goodness that crust is now edible, because I am a fan of flaky, buttery, crisp, golden crust. I especially like the cooked-yet-kind-of-doughy interior bits and the way that texture plays against the savory goodness inside. Note the shards of crisp crust on top. No way were we going to waste those. While collards and other greens cook down to a mere whisper of their raw selves, we still had probably about one and a half cups of leftover greens after our Poor Man’s Meal. I considered an instant-replay of that meal, but then I had two thoughts. Thought one: I have to make a video that shows how to make a pie for my video production group. 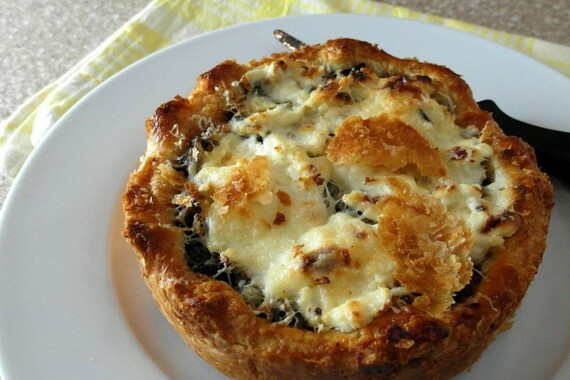 Thought two: I have some leftover rough puff in the freezer from the mushroom tart extravaganza. So, when faced with leftover Poor Man’s Dinner, I took a cue from the Rich Man and put it in a crust. A flaky, edible crust. It had to be small, since I didn’t have a Large Tart’s worth of greens (or of dough for that matter). And it needed to have a ton of flavor, especially since The Beloved enjoys having meat for dinner and this would be the second night in a row that meat wouldn’t make an appearance. I decided to distract him with caramelized onions. 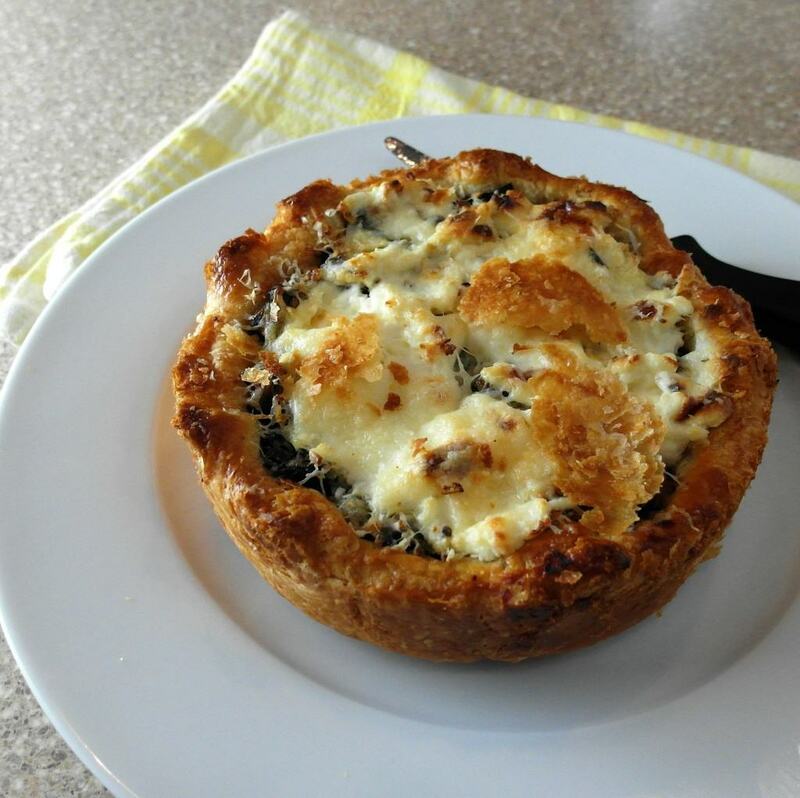 This particular tart was simply constructed of layers of deeply caramelized onions, the cold, leftover, chopped greens and some cheese. While goat cheese was my original idea, the leftover log that I had planned on using, which previously had smelled of hay and herbs, now smelled of unwashed feet. Oh dear. A quick check of the fridge, and I came up with some asiago and good old Philadelphia brand cream cheese. Sold. I’m not going to share the recipe here, because you truly do not need a recipe. Putting bits and pieces of your leftovers together inside a flaky crust is pretty much all there is to it. I do suggest using the recipe for blitz puff from A&J King Artisan Bakers, but do make sure to roll and fold it maybe 3-4 more times than called for. This will keep it from puffing up too much, if at all, but will still give you impossibly thin and shattering layers of crust. A couple of notes, for those of you not quite ready to abandon a recipe entirely. I caramelized one whole medium onion, sliced thinly, in about 1 1/2 tablespoons of lard (use whatever fat you want), 3 Tablespoons balsamic vinegar, maybe 1/2 teaspoon of salt and a few grinds of black pepper. I also added a tablespoon or so of honey, just for fun and a bit of extra sweetness. After the tart was in the oven for about ten minutes, I added small cubes of cream cheese to the top, let it bake for about ten more minutes, and then spread the cheese around a bit with a knife. I added a bit more grated asiago to the top and then let all of that bake undisturbed for the last 10 minutes. Set a thick baking stone on the bottom rack of your oven, and preheat your oven for a good solid hour so the stone retains the heat. This is what gives you a nice, golden, crisp bottom crust without having to blind bake. And here’s the video! 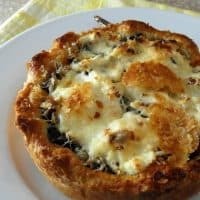 I hope it inspires you to give your own version of savory pie a try! Feel free to use store-bought crust if you don’t want to make your own. Then, just load it up with ingredients that will taste good together! And that is how we turned our humble Poor Man’s Meal into a Rich Man’s Meal. I can tell you that we thoroughly enjoyed both meals, and I hope that you will too. Thank you so much for reading, and I hope you have a wonderful day. One of the reasons I love you, Jenni, is because you seem to cook like I do, albeit with more training and expertise. That tart is “seat of your pants” baking at its very best. What do I have in the fridge and what can I do with it that’s special? With that on his plate, I am sure the Beloved didn’t miss meat at all. Beautiful and delicious! 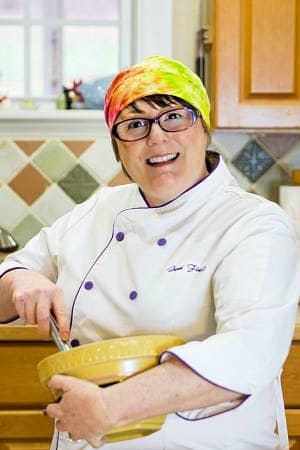 I think folks who cook from the heart always recognize each other, Stacy! Training and expertise aside, it’s the love that really counts, and that’s what I was drawn to in that fig jam post of yours! I am definitely a seat-of-my-pants cook and blogger. lol And this tart was delicious! Do give that dough a shot–it really makes the whole thing. So good! So true about waste, as well as wanting that quick fix such as dinner from a box. I argue this with family (mostly) all the time. Just set aside the time, while the kids do homework and cook a healthy meal. I make many dishes such as these, and call them kitchen sink dinners! The perfect name for them–toss anything into a crust or onto a pizza or into an omelet or a fritatta, and it’s dinner!